First apply a generous amount of the oil (2 teaspoons for me) onto your dry hair from ear down, when there is a tiny amount left on your hand just touch up the top area of your hair to bring shine without weighing it down. Then with the help of the straightening comb use the flat iron to go over all of your hair. After just spray on the liquid hold around the ear level of your hair and spray a generous amount on your palm to go through areas from ear down. Hope you enjoy your Sundays guys and pamper yourself with some treats that would make you happy! For me it is going to be have some fresh tasty food, watch Game of Thrones, and listen to Shoe Dog by Phil Knight on audible. Hey guys! Today I am sharing with you the tile printed dress maternity look. I highly recommend that you look for a-line cuts for dresses made with woven fabrics (non-stretching) for maternity looks, it helps to hide tons of stuff under and you have the option to wear them after pregnancy. I styled my dress with a perforated beige tote and taupe chunky sandals. I really loveeed these purchases and have got tons of uses since received them, not to mention they are on sale with affordable price points! Highly recommend! Hope you guys all enjoy the upcoming weekend and keep exercising! Now it is time to look into your wardrobe for colorful spring pieces and try to match them for outfits out that give you a touch of the warm air yet still keep yourself warm and comfy in a cashmere scarf through on! I matched my outfit in blue hues yet in different tints and shades ( meaning adding white or black to the color). Hope you enjoyed the post and comment below for questions or comments you have! I have been and will reply all the comments. Hey Guys! 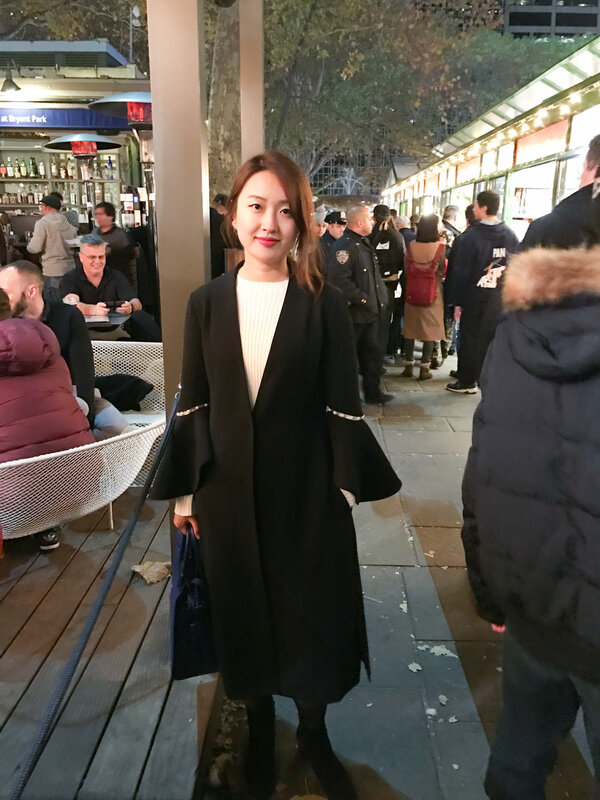 Today I am sharing with you another outfit created from the Bell Sleeve Dress Coat (you can check out the previous one here). I just have to do another post of the coat because it is so versatile and easy to mix and match with the fluttering bell sleeve. You feel like the spring is on your shoulders that you could fly like a bird into the green leaves that are blossoming in spring time. I am apologizing for my not regularly updated blog lately. I do have a very special reason and would like to share with you in a future post when I am ready. I would like to hear if you have any special topics you are interested in. Feel free to comment down below or send me an email! Hope you enjoyed the post and have a wonderful rest of the day! Hey guys! I have been a little behind with updating with you the latest happenings in life. I will post very frequently the next few days to catch up with the missing posts! Today's outfit is embroidered jacket over silk overall. Overalls are quite stylish and comfortable to wear on a short day out. I would avoid wearing if I know I will be out for a long time because the bathroom runs are quite frustrating. Be careful when picking your overall to make sure it is comfortable on the crotch area. Mine is made with silk so it is quite breathable and soft. To finish up the look I put an embroidered tailored jacket to bring more forms and structures to the finished look. This jacket also goes well with jersey maxi dresses. Hope you guys enjoy the beautiful weather outside and start thinking for your spring time outfits! Hey guys! 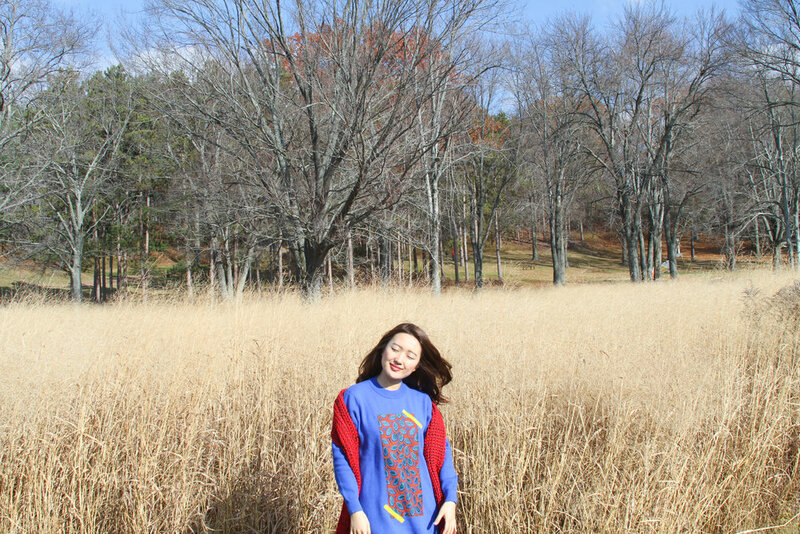 For today's post we have our special guest Claire Geist, who is the talent behind De Lune blog (link attached). Claire took our wrap coat to her winter adventure in Idaho amongst snow mountains and hot springs. You can check out more posts and amazing pictures of her trip and her original post here. The more we explore ourselves, the more we understand and respect our deep values. RUNWAY UNICORN is inviting you to continue to explore, to go places, to experience the full seasons and to embrace life fully by expressing yourselves through uniquely designed quality designer pieces. Celebrate our spirit with Claire and enjoy 20% OFF with code DeLune20, valid until 3/31/2017. Hey guys! Happy New Year 2017! Initially I determined to jump into the industry since having style makes people happy. But I cannot look at the cause the same way after learning the facts and truths of the unintended side effects on our planet. So from now on I would focus on sustainable fashion: to share knowledge I learned through my lens to foster communication and raise awareness, and to learn to be an educated consumer and make purchases responsibly. Hope you guys all get the chance to relax and clear your mind! It is a great time of the year to cleanse, adjust, and focus your energy on goals that align with your values! Hope you guys all learn more of what you love in 2017 and become better yourselves by growth of wisdom and knowledge! Hey guys! Hope you are enjoying the holiday season staying cozily warm. I am sending my love from the magical corner at the New York Botanical Garden! Outfit of the day is plaids and checkers mixed together with light blue sweater and coat. Pamper up your holiday look with colorful plaids and checkers! I am so happy to have the opportunity to have blogged for almost two years now. Appreciate you guys sharing time with me and thank you so much for all the tremendous support and love given. I wish you all a happy holidays with families and friends filled with joy, love, and lots of delicious food:) Merry Christmas! Strive to create value, and try to capture that value created! Such great and fundamental value has motivated both of the greatest entrepreneurs in our era. If you would like to train your mind in quick decision making and execution in complicated situations, Elon Musk indeed take the skill to a rocket high level; If you are struggling in school or career and would like to hear a different perspective, Peter Thiel can show you a whole new world from his personal experience. Guys, we are each born differently, so focus on competition is not always the best way to improve, use our unique eyes to look around, find what interests you or frustrates you, and start to make it better from there. Feel free to leave comments below about your greatest reads recently and what inspires you! Enjoy the rest of the weekend and execute your ideas guys! Hey guys! Now it is December the holiday season again. Oh boy how time flies! Make sure to have some time to yourself to think about what you have accomplished this year and cherish your achievements. Hope you guys enjoy time with your family and friends. There is only time for love guys! A Special Piece from RUNWAY UNICORN FW2016 collection - Bell Sleeve Dress Coat, with cutout sleeves embellished with fake pearls. Uplift your office/casual look with a feminine touch. Hope you guys enjoy the rest of the holiday weekend! Outfit for today is brown embroidered sweater, brown platform boots, styled with blue jeans, blue totes, and monogram shawl in denim blue. The brown sweater is my favorite piece from RUNWAY UNICORN FW 2016 Collection. It has soft autumn color palette that mixes thick brown knits with royal blue top stitches, and hand embroidered sparkling silver and gold tone beads，on 3D knit patterns of leaves. The hollow-outs on 3D leaves compliments your figure and complexion. The hard to find unique piece is really a treasure find for me. The blue pants from J Brand with luxe sateen are really soft and breathable. They usually have sale events like 30% OFF during Black Friday and do not miss out. J Brand does a good job in bringing fit, quality, comfort, and appearance all in one. The blue sac de jour tote bag from Saint Laurent has such beautiful color and shape. It also has plenty of room to fit in your life essentials like sunglass box, water bottle, umbrella and lipsticks. I find it a great investment. I usually do not like logos on my outfit, but I find the Louis Vuitton monogram shawl in denim blue very subtle and feminine. The patterns and fringes in silver thread over denim blue gives a lift to your everyday casual looks. I have attached all the product links above for your reference. Share with me any thoughts you have on the post and have a cozy weekend with your family and friends! Outfit for today is wool and mohair blend coat in violet, a very special and unique piece that add the finishing touch to monochromatic basics. I recently finished the audible book Love Warrior . The author's honesty and spirit to seek truth is well received by the crowd. Show true self to your people, even if it is the dark side, failure, or insecurities, not to seek comfort or agreement, but to achieve understanding. From that you have made building bricks to truly bond and feel intimacy with your love, family, and friends. I have mentioned acupressure mat before, if you are interested you can check it out here. Inversion table has similar function to relieve back and neck stress. It allows gravity to do most of the work to correct your spine and bring nutrients by improving circulation. Another great benefit is the anti-aging effects. Gravity give a lift to your body and skin while you lay upside down. The downside of the machine for me is I felt like vomiting and headache the first time going perpendicular. Later I learned to control the angle by putting an exercise ball under to support me invert at 45 degrees. I feel I find the right exercising tool for myself. You could find my purchase through this link. Hope you guys start getting to know yourself - share, understand, reflect, and support sharing amongst your people! Hey guys! Today I am talking about oversized scarf, hair tool review, and fashion in my eyes. Hope you enjoy and leave me comments if you want to share your thoughts. The simple item is an oversized knitted scarf in red with black undertone. I wore the scarf over a red sweater, black wrap coat, black cropped pants, and red lace-up pumps. The black coat and pants make your body a complete piece, adding of the red scarf to the top and red pumps to the bottom serves as highlighter that elongate your body. Oversized scarves are my favorite because they make you so cozy and warm underneath without compromising style. This piece from Rag and Bone is just the right size, color, material, hard to find combination that even though it is a bit pricy, I invested knowing that I would get a lot use of it to mix and match. I tried AMIKA thermal brush to try to mimic smooth and shiny hair you get after visiting salon. It is making the blowout so much simpler by working directly on dry hair, so you could let the hair dry naturally the night before. I found this tutorial video that you could check out on Youtube. The tool make hair look smooth and shiny and feels good when you touch it. I believe that fashion is simply a nutrient that you put on yourself, like food and drinks to your body. It is a willingness, a journey, a learning curve to explore and find your true self - what colors delight your eyes, what silhouette fits your body shape, what messages are you sending out to the world, what is your life story. Fashion is not about creating, transforming, becoming, or inventing another self. It is about going deeper and deeper into yourself and never stop learning and knowing who you are, and fully embrace and accept it knowing that you could be just beautiful being who you are. Etsy.com AnythingbutPlainJane yellow clutch; AdrianaSoto knuckle ring. J Crew bar rings. Hey guys! Are you all excited for the foliage?! This Saturday New York has the perfect weather for you to hit the road! The outfit for today is neon yellow coat, blue wool pleated dress, styled with sheer tights, suede chunky ankle boots and yellow clutch. I also wore some statement rings that I got from Etsy and J Crew. You could find very versatile jewelries from both and they are very affordable. I also want to talk a little bit about color. I know you guys are all familiar with opposite colors. They are the pairs that create the strongest contrast when placed next to each other. In modern color theory, the complementary pairs are red–cyan, a greenish-blue color, green–magenta, and blue–yellow. You could create outfits with these in mind if you want a vivid fresh look. I do take color very seriously when pairing outfits together, so I keep a color wheel at home for reference. Hope you guys all enjoy the weekend and refresh yourselves with vivid colors for your outfits! Dear all, today's outfit is blue denim jacket over all white, styled with leopard kitten flats and brown box bag. The lace wide leg cropped pants in white are essential to this look. It adds a delicate touch to the pop culture denim jacket. You could actually take off the jacket and wear the outfit in office surroundings. I am thinking recently to add an audible version of my blog, so you guys can actually be listening whilst engage in other ongoings in life. I noticed many people get frustrated with reading (including me), and listening to audibles could make a big difference. I have tried Amazon Audible lately and find it very helpful, especially with books in your second language, like English for me. I am not paid by them to say these, all the things I recommend in my blog are what I genuinely love and want to share. If you are interested in the idea or have other suggestions please let me know! I also attached the book In Sheep's Clothing below that I recently listened. It is a book that gives you more insights into dealing with manipulative characters. I think it might be of use to everyone in some points in life. Listening to an audible is a great passive adventure that you could experience at home on a rainy Saturday. Hope you all do something fullfilling today! The outfit for today is leather jacket, printed tie neck blouse, distressed jeans, paired with lego love clutch, and a pair of red lace-up pumps. It is perfect for any plans you have for the upcoming weekend. If you are going apple picking, replace the heels with a pair of leather sneakers will do the magic! I would recommend darker lipstick shades to go with the look. I would love to hear your plans for the weekend! Let's go places! Hey guys, today I am sharing with you moon-star embellished cotton sweatshirt with lace midi skirt, pointy toe pumps, and red satchel. If you are wondering, the sweatshirt is from Paul and Joe, they always have the cutest sweat shirts or sweaters that I love. Also I have great news for you guys! You can now shop at RUNWAY UNICORN with my discount code NEWOPENING for 10% off now until 10/30/2016. Supplies are limited so if you like any of the styles get them sooner than later. Enjoy the rest of your weekend and relax. My plan is to watch a movie or play Super Mario after I am done with writing the blog. Tell me what you do to relax for the weekend! Hey guys, today I am sharing with you an autumn look of a soft touch light grey oversized drop shoulder coat over ivory crew neck shirt and cropped wide leg pants, styled with a pair of red color lace-up pumps with kitten heels, and a neon orange clutch. If you are wondering the pond in the picture is the Turtle Pond located on 79th St East of Central Park. A walk in the park is a good choice for the sunlight deprived weather lately. Hope you all stay warm in the changing weather and keep weekend activities going!